If you're willing to take on a little more risk, these five stocks could net you huge rewards. Risk in investing is best described as the likelihood of taking a permanent loss -- i.e. buying stock in a company and seeing the share price fall, and either it never recovers or you sell before it does. And while it's not true that more risk automatically means more opportunity (penny stocks, for instance), it is true that there are some compelling companies that could generate massive shareholder returns, if a few things go right. But if those things don't go well, shareholders will feel the impact. If you're willing and able to take on more risk with at least some of your investing dollars, one of those companies could be exactly what you're looking for. Our contributors have five higher-risk stocks that they really like, including Illumina, Inc. (NASDAQ:ILMN), Fitbit Inc. (NYSE:FIT), Trevena Inc. (NASDAQ:TRVN), athenahealth, Inc. (NASDAQ:ATHN), and Hain Celestial Group Inc. (NASDAQ:HAIN). Jason Hall (Hain Celestial Group): What makes Hain Celestial worth investing in? To start, it's a solid company with a very long track record of earnings growth, still led by a founder with a substantial stake in the company. Add in that the company's business focuses on the fastest-growing segment of the food industry, making and selling natural, organic, and "better-for-you" packaged foods and meats, and there's a lot of reason to think the company can continue its past success. Where's the risk? In short, it's being willing to trust that a recent accounting hiccup isn't a full-on scandal. Last August, Hain announced that it was delaying the release of its fourth-quarter and fiscal-year 2016 results, after learning that it had recognized revenue in periods that may have violated U.S. GAAP (generally accepted accounting practices), and as of this writing, we are still waiting to learn exactly what management found, what it's doing about it, and what the financial impact was on the company. That adds up to a lot of risk that what happened was bigger than just recognizing revenue at the wrong time. It could be that in the two quarters since the company told us this was happening, the business results have deteriorated. At the rate we're going, it will be nearly a year since Hain last reported before we get any updated financial results. The company expects that any potential changes in the timing of the recognition of revenue with respect to these transactions should not impact the total amount of revenue ultimately recognized by the company with respect to such distributors and does not reflect on the validity of the underlying transactions with respect to such distributors. In short, it's about recognizing revenues at distributors, versus when the products are sold to retailers. Sure, "channel-stuffing" is a concern, but Hain's cash flows have been solid for years, and that indicates the company hasn't been channel-stuffing. 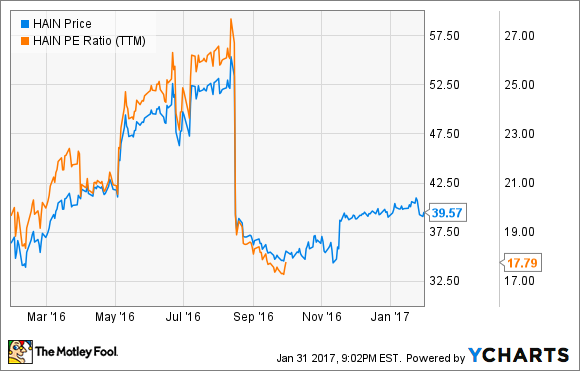 Bottom line: There's a lot we don't know about Hain's business since early in 2016, and there's risk the business has deteriorated. I'm willing to bet on the company's long track record of cash flow growth, and I'll take the risk that this is the accounting error management says it was and not a fundamental flaw in the company's results. Todd Campbell (Illumina): If you invest to the beat of a high-risk drummer, then you're probably most intrigued by game-changing companies that are reshaping big markets. If that's the case, then let me introduce you to Illumina, the world's biggest maker of gene sequencing machines. Researchers worldwide are already using more than 7,500 Illumina gene sequencing machines to make groundbreaking discoveries in medicine, and that type of research could be about to soar, thanks to innovative products that could reduce the cost of sequencing a genome to an astonishingly low $100. This year, Illumina will begin marketing two new sequencers -- the NextSeq 5000 and NextSeq 6000 -- that will allow researchers to sequence more quickly and more accurately than ever before. 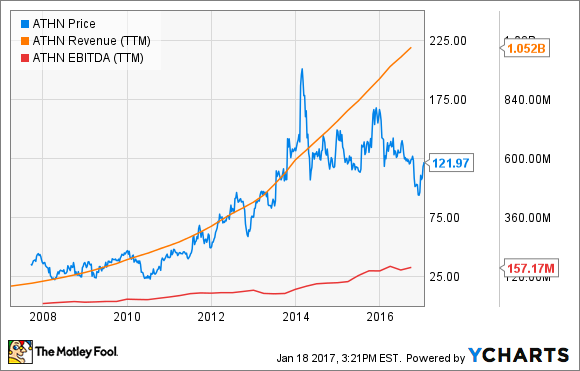 If history is any guide, then the potential financial upside for Illumina could be tremendous. In the past, when Illumina has rolled out new technology that reduces sequencing costs, it has created a big and sustainable spike in sequencing demand that's boosted the company's sales, profit, and share price. While no one has a crystal ball that can say for certain that sequencing demand is about to head higher, I believe that developing next-generation therapies based on a better understanding of our genetic code is the future. If I'm correct, then buying shares in this company could produce profit-friendly growth for investors for years to come. Evan Niu, CFA (Fitbit): Wearable technology was heralded as the next big thing in tech, but so far the market has failed to live up to the hype. That's not to say wearables have failed as a product category, but rather they just haven't taken off as quickly as some had initially predicted. Fitbit is largely responsible for catalyzing the initial spike with its basic activity trackers that have soared in popularity, but as the market begins to evolve toward smartwatches that can do a lot more than just activity tracking, things have become a bit murkier. Fitbit doesn't yet have a product that technically qualifies as a smartwatch, as Fitbit devices don't support third-party apps. But the company is working on exactly that, which will leverage three of its recent acquisitions. Fitbit has suffered from some operational setbacks over the past year, and execution has left a lot to be desired, but I still think the company has some long-term potential -- especially at current prices that are dirt cheap. Investors aren't giving Fitbit any credit right about now, in part because of recent challenges, but there could be a turnaround in the works. At this point, it's extremely difficult to make this call with any sort of certainty, which is why Fitbit could be a potential turnaround candidate for investors with a high risk tolerance. If consumer preferences begin shifting more rapidly toward smartwatches and multi-purpose wearables, the company risks losing traction in the wearables market that it helped to create. But if Fitbit can successfully navigate that shift and create a compelling smartwatch with a software platform for third-party apps, it could rebound in a big way. It's not clear which of these scenarios are more likely, which is why I'll be sitting on the sidelines. But as you know, high risks also come with the potential opportunity for high rewards. George Budwell (Trevena): Trevena is an under-the-radar clinical-stage biotech that's developing a potentially disruptive injected pain medication called oliceridine, which is currently in two late-stage trials assessing its ability to act as a first-line treatment for patients experiencing moderate to severe acute pain in situations where IV administration is preferred. Results from both studies are expected to be announced in the first quarter of this year. From an investing standpoint, Trevena's upside potential depends not only on having its lead drug candidate hit the mark in both of these ongoing pivotal trials, but also on assessing oliceridine's overall performance, in terms of safety and efficacy, when compared against morphine -- a secondary endpoint in both trials. Trevena's plan is to have oliceridine become the go-to drug in acute-care settings, displacing the motley crew of opioid analgesics morphine, fentanyl, and hydromorphone that currently dominate the landscape. To do so, olicerdine needs to prove to be at least as effective as morphine at alleviating pain, but less prone to producing serious side effects such as respiratory depression, nausea, and vomiting. If oliceridine is successful on both fronts, it's reasonable to assume that this novel pain med could grab a significant chunk of the injected-pain-management market -- implying a peak sales potential in the hundreds of millions. That's a noteworthy figure in light of Trevena's sub-$400 million market cap at present, and it underscores why the Street's 12-month price target implies that this stock could nearly double from current levels. The flip side is that no clinical trial is ever a sure thing. And if oliceridine does fail to clearly differentiate itself from morphine or flat out misses its primary endpoint, Trevena's stock will almost certainly take a nasty hit, given the early-stage nature of the company's remaining clinical assets. Daniel Miller (athenahealth): Athenahealth offers cloud based healthcare software and services that enable healthcare providers to more effectively track and collect reimbursements from insurers, store consumer health records electronically, and coordinate various management tasks. Because its software is cloud-based, it's more quickly and easily updated than traditional installed platforms are. Essentially, it generates revenue by charging a percentage of its clients' total collections, which typically ends up cheaper for clients than a more traditional IT system. It also aligns athenahealth's interests with its clients' because the former's revenue will increase proportionally to its clients' total collections. So what's the risk, you ask? While it's grown its top line quickly, its focus on market share and growth over profit -- not at all dissimilar to Amazon.com in this regard -- could come back to bite investors if down the road new competition hurts its business before profits accelerate. Also, as athenahealth expands into the acute-care space, it will compete with larger and more profitable companies, such as Cerner. Ultimately, while athenahealth's software is compelling, the truth is there aren't barriers of entry to a cloud-based healthcare IT system. It's a risky stock, but if it carves out a larger market share and focuses on profitability, it could reward patient investors.